Completion is required in order to receive Social Security Disability benefits. This is the first form you will fill out and it is probably the first one the Disability claims examiner will see. Many questions are straightforward, like your birthday, address and names of your children. You will also need to know your onset date of Disability, dates of employment and the amount of money you earned this year and last year. You can fill out the Social Security Disability Application form online, drive to a local Social Security office, or contact us and we will complete it for you. We’ll complete this form for you quickly. Call 877-568-8413. Pick the Right Onset Date. Selecting the wrong onset date could potentially cost you thousands of dollars in Social Security Disability back pay. Some applicants tie their onset date to a medical event, such as a hospital admission or date of diagnosis. Others pick the last day they worked. Regardless of what date you choose, make sure it is backed up by medical evidence and your work history. If you have questions, seek legal advice from an experienced Social Security Disability lawyer. Let our Disability team handle your application. Call 877-568-8413. 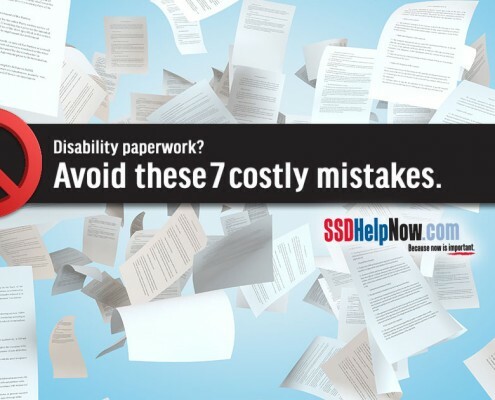 We’re here to help with the Social Security Disability Application Form. Many Disability attorneys do not represent applicants at the very start of their case. They only take cases that have been denied and are being appealed. That is not us. Our team prefers to get a head start on your claim. Our Disability team will carefully gather the necessary information, thoroughly and accurately fill out your Social Security Disability Application form, and submit it for you. We know what the Social Security Administration wants and how to present in a way that is most beneficial for you. This hands-on approach makes the application process much smoother and will give you the best chance to get approved during the first round. Not to mention, it won’t cost you anything up-front. We work on contingency, which means we only get paid if we win Disability benefits for you. Our fee, which is capped by the federal government, is the same no matter where you are in the Social Security Disability process. We think it’s best to start sooner, rather than later. Call us today at 877-568-8413. Let’s get started on your application.